High-speed Internet for home & business. Why sell CenturyLink as an Authorized Retailer? Business owners can choose from a variety of Internet packages and options to suit their needs. Everything from small and medium sized businesses to larger organizations in the public sector can benefit from a customized plan. As a business-to-business solution, you’ll be able to help them solve customer challenges and expand their operations. 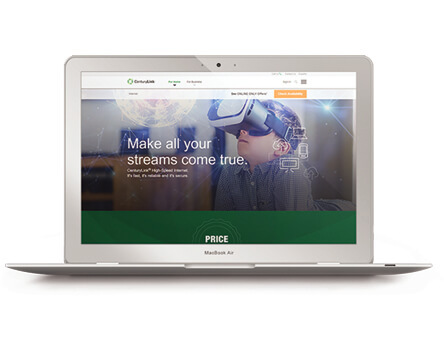 CenturyLink High-Speed Internet connects all day, every day with a private, direct connection to a network designed for consistent speed with 27/7 support. CenturyLink @Ease, featuring Norton backup and security gives you confidence that your data and identity are protected. Select from customizable levels of backup space and support. With CenturyLink High-speed Internet, you're always connected to our reliable national network. Chose from a wide range of available speeds including new speeds up to 1GB, so you can power all your devices at once, download HD movies in seconds and do more than you ever thought possible. CenturyLink Home Phone service is always on when you need it most. Calls can be placed via landline to family and friends with no delay and clear reception, even when the power goes out. Includes unlimited local and national calling and popular calling features such as caller ID, voicemail, and call forwarding. CenturyLink is recognized as a leader in the network services market by technology industry analyst firms. The company is a global leader in cloud infrastructure and hosted IT solutions for enterprise customers. CenturyLink provides data, voice and managed services in local, national and select international markets through its high-quality advanced fiber optic network and multiple data centers for businesses and consumers. RS&I offers nationwide sales opportunities for CenturyLink throughout their service footprint. Our CenturyLink retailers have access to 9 regional RS&I sales centers.